How would you like your map? Paper or plastic? Folded or flat? On the wall or on your computer screen? How about on your phone or tablet? Williams & Heintz Map Corp. specializes in printing large paper and plastic maps. We sometimes publish too. We publish the Maryland Cruising Guide and Virginia Cruising Guide, nautical chart books of the navigable waters of Maryland and Virginia. This year the new printed chart book will come with links to take you to an App, so that you can have the Williams & Heintz Cruising Guides on your iPhone, iPad, or Android phone too. The digital charts, for your phone or tablet, are free with the purchase of the Virginia or Maryland cruising Guides. You can also purchase individual charts separately. First, install Avenza’s FREE PDF Maps App. It is available from I-Tunes or Google Play or at http://www.pdf-maps.com/get-pdf-maps. Go the the Williams & Heintz Cruising Guide web site to scan the QR code that corresponds to the chart you wish to download. Printed paper maps will always be part of mapping. The App is not replacing printed products; it complements the printed charts. The app has functionality for locating (via GPS), measuring, plotting points, importing and exporting points. This spatially referenced map shows exactly where you are. And with the paper chart, you know where you’re going. Tags: Avenza, Cruising Guide, digital chart, geospatial, Map, map printing, Maryland, nautical chart, PDF maps, Virginia, Washington D. C.
I prefer my maps on paper because I like to see the big picture. But when you want to use your iPad, iPhone, or iPod Touch for navigation, information collection, and sharing geographic information and knowledge, Williams & Heintz Map Corp. is working to make your maps available on-line with the Avenza Geospatial PDF Map App for iOS. The PDF Maps App is a geospatial PDF, GeoPDF® and GeoTIFF reader for your Apple iOS devices to easily download, browse and interact with maps. Streaming services don’t work when there is no internet connection, like when you are cruising down the bay, hiking or traveling in remote unconnected areas. Services that rely on a bandwidth connection may have expensive data roaming charges when you are outside of your home data area. Google Maps, and other streaming free services, aren’t designed for specific purposes like hiking, boating and visiting national parks. Printed paper maps will always be part of mapping. Electronic devices are not replacing printed products; they complement each other, and make each more effective. By offering this mobile option, we are increasing the value of the printed maps. 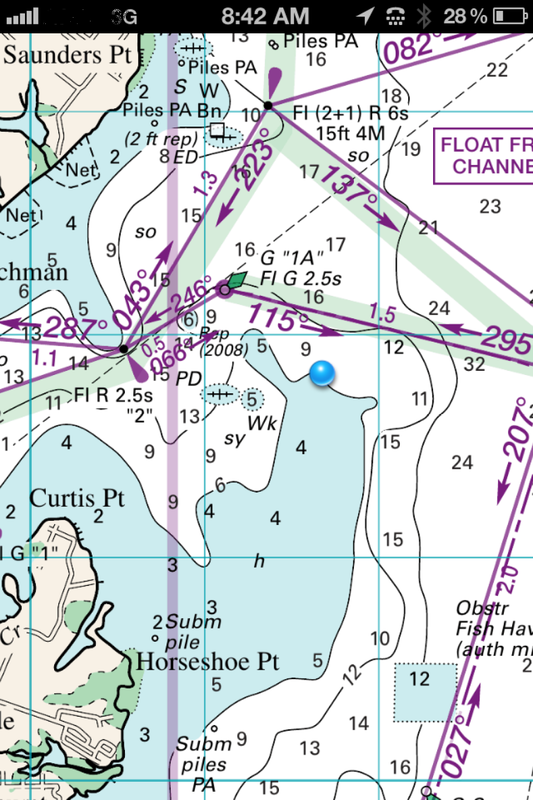 Our first map, Maryland Cruising Guide Chart 5 Sandy Point to Tilghman’s Island is now available in the Avenza Map Store. The app has functionality for locating (via GPS), measuring, plotting points, importing and exporting points. This spatially referenced map shows exactly where you are. And with the paper chart, you know where you’re going. The Avenza Map App is FREE, and for a limited time, our first chart is too! Please try it out. I would love your feedback on our new beta map. This nautical chart is also available for print on demand, on wet strength paper, and in large print. For more information, or to purchase a printed copy of the Maryland Cruising Guide, visit the Williams & Heintz Cruising Guide Website.